Although I’ve clearly taken sides in the ongoing conflict of gym vs. member, the strategies on both sides deserve recognition. Gyms have the home field advantage, of course, forcing members to devise engineering marvels just to get in a decent workout. At one gym, I came across an ingenious solution to the inexcusable lack of a pull-up station. 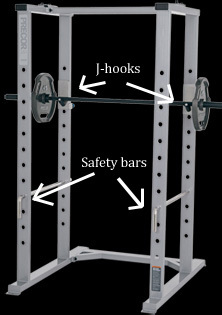 Some members had laid a barbell across the top of a squat cage and used lifting straps to fasten the bar to the frame. At a different gym, I watched a guy approach the squat rack at the beginning of his leg routine, only to find that the j-hooks had mysteriously disappeared. He moved the safety bars to shoulder height and flipped them upside-down, creating makeshift arms on the outside of the cage to prevent the bar from rolling off. Members aren’t just suffering these humiliations sitting down, however. In the sauna, I was recently stunned as one gentleman got up from the bench and poured his half-finished water bottle all over the top of the electric heating unit. I don’t know if he confused the geothermal rocks in an authentic Swedish sauna with the expensive box plugged into this sauna. Regardless, while everyone else looked on approvingly, I got the hell out of there. Although members do score the occasional victory, gyms continue to innovate around crushing the spirit of their clientele. This morning, I stopped at my gym’s entrance to take in a new poster touting improvements coming soon. My muscles tingled at the thought of a better leg press, a replacement for that clunker of a calf-machine, and new treadmills that don’t malfunction mid-run. But then I read the details of the planned upgrades: More kettlebells, a coat of paint for the cardio room, and a renovation of the smoothie bar. Well played, indeed. This entry was posted on Sunday, December 13th, 2009 at 8:04 pm and is filed under Gyms. You can follow any responses to this entry through the RSS 2.0 feed. Both comments and pings are currently closed. I love this equipment. I can do my squat and my rack deadlifts. Greatest invention ever made lol. Great idea to use the squat cage for pullups, I wish there was a way to modify it for dipping too. I too, remember in my younger days being excited about getting a new piece of workout equipment. Today, I’m excited just to wake up alive and hit the gym 2-3 times a week if I’m lucky. Family life has caught up to me, but I still fight it to this day. I think Gyms should have a segretation policy. The thin, slim really fit people should not be allowed on the machines in public. They should excercise in a room of their own. Not only do I have to suffer the humiliation of going at 0.01 miles per hour on the running machine, but I alwasy seem to get beautiful Barbie running her half marathon in under an hour beside me. I think it is a conspiracy, and slim fit people seek out the likes of me when they pick their machines just to make them look better. Actually, maybe I could hire myself out!!! Now there’s an idea. There’s a lot to be said for exercising in the privacy of your own home or apartment. 🙂 I know you don’t have access to the machines, but supposedly free weights give you a better workout anyhow.